Please be informed, that our tours are fully inclusive (motorcycle rental; accommodation; fuel; tour guide; all entry fees; all meals: breakfast, lunch, dinner; soft drinks and much much more …) So you can completely focus on your holiday, the adventure and the riding. There are no hidden costs or other surprises – our tour prices are the final prices. Fact! Only the beer in the evening you have to pay by yourself … Hehehe … ? Provisional Tour booking requires a specific date, choice of motorcycle model, and minimum 10% deposit paid immediately. A deposit will be fully refunded for tour cancellations more than 30 days before the tour starts (excluding bank charges or any other costs incurred in the transfer). A deposit is nonrefundable if the booking is cancelled less than 30 days before the starting date of the hire. The full hire fee is to be paid 14 days before the Tour start date, in order for the booking to be confirmed. If the guest does not commit to payment 14 days before Tour start date, the booking may be cancelled. The tour is, of course, possible to book. Please contact us for further details and information. In most cases yes! There is a minimum number of riders required to operate a scheduled motorbike tour. 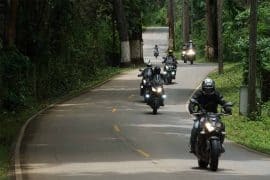 However, as our minimum amount required is only two riders in most cases we can fit you in a tour with other riders already booked, if not, providing you give us some notice we can take a reservation from you and open it up for others to join your tour thus making the minimum required number. At the end of the day be sure to contact us! Of course, the other way can be, that you have to pay the full price for two riders. 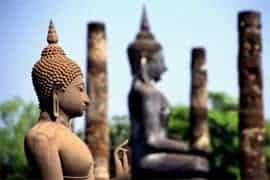 Most customers touring with us usually come from Bangkok, and in this case, we recommend travelling up to Chiang Mai by one of the many flights operating on this route. It is not expensive and with companies such as Air Asia (www.airasia.com) or Bangkok Airways (www.bangkokair.com). The earlier you book, the cheaper the flight. The train (night train) is another option; however, the Thai train network needs a serious overhaul! Take a look at the difference between the train cost and the flight costs compared to one hour flying time or a 12 hour train journey along with the fact that the trains are notoriously unreliable. The train option is usually the odd one out! Also, a lot of busses start every hour from Bangkok’s Northern Bus Terminal (Mo Chit – Chatuchak) to Chiang Mai. Travel time with the bus will be around 8 hours. 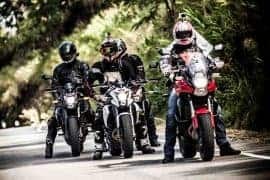 We are able to accept payments for our motorbike tours in the following currencies calculated at the current Bangkok Bank exchange rate against the US Dollar at the time of booking: Thai Baht – US Dollar – Euro – Australian Dollar – British Pound – Swiss Franc. No! 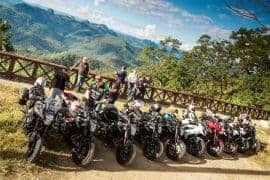 You can pay deposits and final balances for your motorcycle tour via Paypal with most major debit cards, or you can pay via bank transfer, you can even pay by personal cheque or cash on arrival. Please have a look at our “GTC” (General Terms & Conditions) page from the footer menu bar. We drive on the left as in England and Australia. All speed limits are in km/h, 30-50 for towns, 60 for suburbs and 90 for major (A) roads and dual carriageways. I’ll happily cruise along the open road at a good clip, but we must always slow right down through the towns/villages, 50 km/h maximum. There are often kids, dogs, chickens, etc., kicking around in the streets. Also, if you see the tour guide braking, there’s a good reason – and you should break, too! Many Thai´s ignore the typical unwritten rules of road positioning and merging we are used to in the West. We’ll go over this in person so don’t worry. There is always a “sweeper” and a service vehicle to make sure any riders caught by a traffic light or water buffalo crossing delay do not get separated from the group! Every day, we will offer advice on the best things to see and do, but you’re under no pressure to follow the (small) crowd. You can strike out on your own at any time and simply meet back up with us when you’re ready. We’ll have preferred routes mapped out for you – but anyway you choose to arrive at the booked hotel is up to you! There are elephants and water buffalo´s … although you might not get there in time for dinner! For general inquiries you can use the “contact us” button on the top right and fill out the form or send a direct message to either Kay or Noah using the following contact details. Please be informed about our Thai office hrs (GMT +7); 10.00-19.00, 7days/week. These hours apply to our mobile phones too. Please think about the time difference, before you make a call, thanks for your consideration: Kay – English/German Language +66 87 316 0907 (kay@bigbiketours.net); Noah – English/Thai Language +66 80 127 2595 (noah@bigbiketours.net); Also you will find us on Facebook (Big Bike Tours), you can click on the Facebook Icon on the top right side of this website too. Any damage, mechanical or electrical failure on any Big Bike Tours motorcycle must be reported to the tour leader immediately. Included in the tour price is standard motorcycle damage insurance which covers you for incidental damages. You will be liable for the first 25,000 THB in any claim and in the event of a write-off (never happened yet) you will be liable for 100,000 THB (Thai Baht) We do offer an upgrade to this insurance bringing the liability down to 10,000 and 75,000 respectively if you wish to upgrade it (500 THB per bike and day). Please note this is only applicable to tours within Thailand. We’re not in a race on our tours. 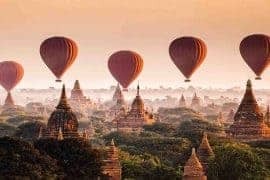 There’s a lot to see and a lot to do in Asia that doesn’t involve riding along some of the world’s most scenic roads. Although that is certainly a great reason for booking your trip! We usually ride about 200 to 250 kilometers daily. We leave our hotel around 8:30-9:00 a.m. After breakfast. 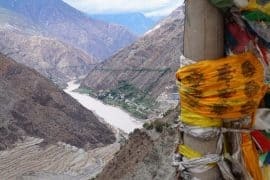 Stops for attractions, photos, activities such as feeding the elephants or visiting a mountain-top village or temple are scheduled before and after lunch depending on the group’s preference. We break to stretch our legs and share a coffee or cool drink about every hour or so. Our goal is to enjoy the ride and take in as much of the local culture as possible. It’s a Once-in-a-lifetime trip – we don’t want you to miss anything! 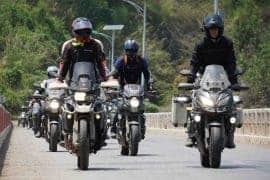 No, a valid national driving permit or a valid license with motorcycle amendment from your home country – are all that is required, cause you are on a guided motorcycle tour with us. Where our luxury van or the service vehicle is not available we supply a 10 liter backpack for use on tour. This pack will sit easily on the back of your bike, and it carries a large amount of gear that compresses down very small. Every motorcycle also has the option to put a topbox or panniers on. Any remaining luggage not needed on tour can be left in our Chiang Mai Office safe and secure. Yes, we highly recommend and it must cover you for riding motorbikes of 250cc or more. 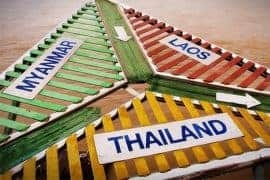 Travel insurance for Thailand even including motorcycle cover is not expensive and will offer you many benefits if you need to claim. Riding anywhere in the world without adequate travel insurance is lunacy and obligatory on all our tours! 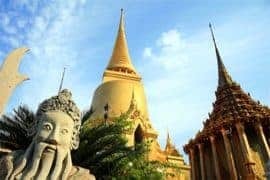 People from 43 countries around the world are able to get a free Visa on arrival at the Suvarnabhumi Airport (Bangkok) including EU countries, Australia, Canada, USA and New Zealand. The visa is for 30 days and very easy to do on arrival. Just fill out the form and give together with your passport to the immigration officer. But if you are planning on staying in Thailand longer we suggest applying at your local Thai embassy for a longer visa. When you apply to join one of our bike tours, we will advise you on visa regulations. With such a great destination to take a motorbike tour from October to February. 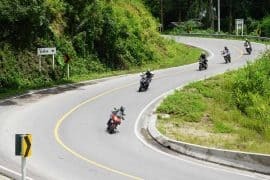 This is the best time to ride Motorbikes in Northern Thailand with warm temperatures, clear blue skies, sun, hardly any rain and forests alive with fresh, lush greenery from the recent monsoon season. Most of our motorbike pictures on this website were taken this time of the year! 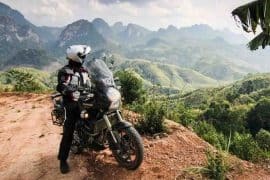 Northern Thailand is without a doubt the premier destination to ride motorcycles in Asia. So it is best to choose the time of the year where you will get maximum enjoyment from the country. However, please be informed that March and April are the hottest months of the year. Temperatures can be up to 40 degrees at this time (“Hot Session”). Mai and June the temperatures following down to pleasantly 30 degrees with big riding fun guarantee. This time of the year will add a great deal of adventure to your motorbike tour! 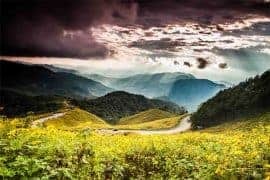 Unlike the south of Thailand, the Northern regions only have one monsoon season, and it continues for an incredible 4 months, but it is not as bad as it sounds. 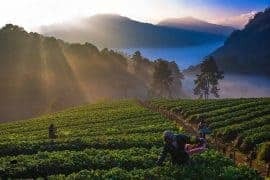 It doesn’t rain every day but when it does it really rains, so our guide below gives an indication of the best time to ride in the monsoon season in North Thailand. We have a stock of motorbike helmets, jackets, gloves, body protection and knee guards. Good quality and only European brands in many different sizes. Please tell us what you may need from us, and we will hold whatever we can for you, but please understand we cannot guarantee a brand new quality as they have been worn by many riders on our tours and the sizes may not fit you correctly. We recommend bringing your own gears to feel the most comfortable. Please be informed, that we do not offer boots and trousers as due hygienic reasons. Good trekking or sports shoes and jeans (Kevlar) should be enough. We do not go racing, we want to tour … ? Certain motorbike gear can be bought in Chiang Mai, but European standard gear will cost more than in your own country! There are many manufacturers (mostly Chinese) that sell motorbike gear here in Thailand and to be fair for the price most of it is actually good quality. Jackets and Trousers, knee pads, arm pads, etc. can all be bought in Chiang Mai. However, please make sure you arrive in Chiang Mai allowing yourself plenty of time to buy anything you may need.